Lassie got help for her owner; how would your dog do? How empathetic is your dog? 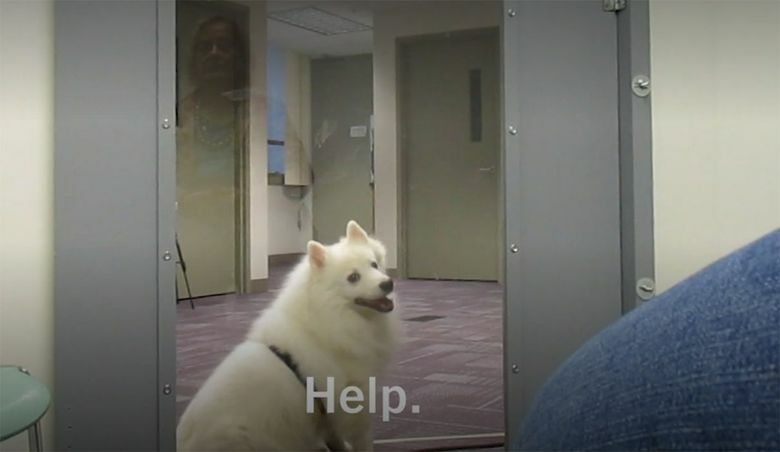 An experiment involving 34 dogs of various breeds tested whether they would push through a magnetically sealed door to “save” their owners. Usually the title of a scientific paper leaves people without the appropriate Ph.D. scratching their heads in puzzlement. “Timmy’s in the Well” is an exception. As you might imagine from the reference to a mythical episode of the “Lassie” TV show (Timmy never did fall down a well, although Lassie did), this is a report on whether dogs would help, or not help, their owners. And the research was, of course, inspired by a collie. Julia Meyers-Manor, who studies animal behavior and cognition, had some experiments going on investigating empathy in rats that were running into some difficulties. Then, she had a dog-inspired epiphany. Her collie, however, came at a run and started digging her out. Aha, she wondered, why not use dogs and people instead of rats? The people would cry for help and the dogs would, or would not, respond. She discussed the idea with Emily Sanford, then an undergraduate at Macalester College where Meyers-Manor was then teaching, and they designed an experiment. They tested 34 adult dogs, big and small, purebred and mutt. The owners were in a small room with a window and a door easily pushed open by even a small dog’s nose or paw. Some owners said, “Help” in a neutral tone of voice and hummed “Twinkle, Twinkle, Little Star.” Others said “Help” in a distressed tone and cried. The dogs did not exactly replicate Lassie’s television performance. About half of them opened the door for their owners, and the numbers were the same whether the owners were humming a happy tune or crying. On the other hand, the dogs that did open the door did so much more quickly for crying owners than they did for humming owners. So maybe they really do care. Also, Meyers-Manor and her colleagues recorded the dogs’ heart rates and their behavior and found something intriguing. The dogs that didn’t take any action when their owners were crying showed higher stress levels than the dogs that did act. Perhaps, she said, their high levels of anxiety inhibited them from taking action. Of course, some dogs were neither anxious nor helpful. They just relaxed or looked around. Meyers-Manor said she didn’t have enough information to offer prospective dog owners any tips on what breed or type of dog to get if you plan to fall down a well. But if you are worried about being buried in pillows, a collie might be a good choice.